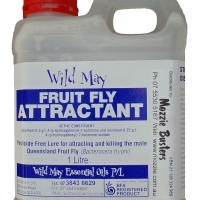 The Wild May Fruit Fly Control System is an organic, pesticide free system for controlling the Queensland fruit fly, Bacterocera tryoni. This native Australian attacks a wide range of fruits in particular peaches, nectarines, plums, citrus and guavas to name a few. 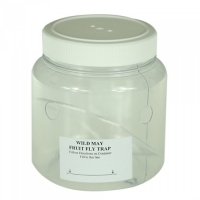 Wild May is a male attractant; it works by attracting and killing all the male flies, including juveniles before they can breed. As the female needs to breed before she lays her eggs if there are no male flies present in an orchard she will have to leave the site in search of a male elsewhere. This eliminates the need for expensive sprays to protect fruits. 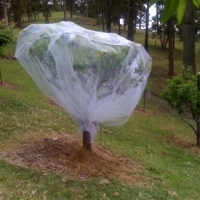 The traps are simple to use and cost effective as a means to protect an orchard. It is recommended to use four traps per hectare. These can be purchase as a kit or home made from a plastic drink bottle. Hang traps upwind in a shaded branch on the eastern side of a tree approximately 1.2 meters off the ground. 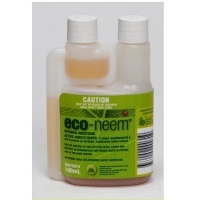 Pour 20mm of attractant into the base of the trap, this level of fluid will need to be maintained throughout the year, top-up when it drops to 15mm. Do not let the traps dry out. When recharging the traps remove dead flies from the liquid taking care not to spill any of the liquid on the ground as this will attract flies. Wild May is BFA registered so it is a product suitable for use by all organic produces and home gardeners. 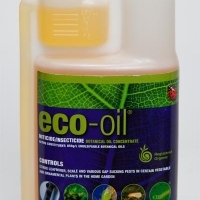 It will not harm other beneficial bugs and insects.